The Big Room is ready for students to return after a long and quiet summer. This coming Tuesday the class of 2017 will return to the Hill and prepare for the coming year. We look forward to the rest of the classes returning next Wednesday and to the official start of the 2016-17 school year! Two months, 12 days and several thousand miles after the start of her journey, rising Senior Noa Sadeh has returned home from her cross-country bicycle trip. Congratulations on completing such an inspiring trek! Stained glass bird by Saskia Fourmon '17, one of several pieces adorning the windows of the dining hall. 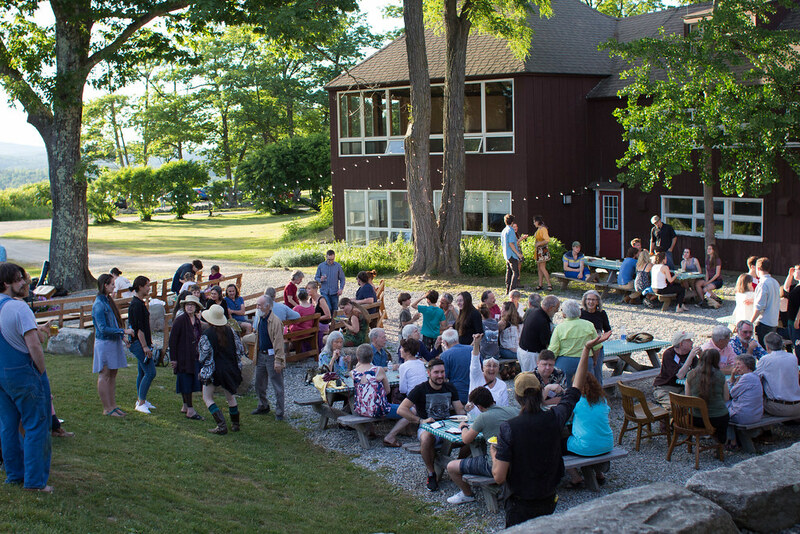 Last weekend over 100 guests attended a locally sourced meal and dining experience held by the Temple Wilton Community Farm and The Farmers Dinner in Frye Field at High Mowing School. All proceeds from this event went towards the Temple Wilton Community Farm's effort to purchase their land. Photo by Matthew Lomanno Photography. A glimpse of the Wapack Mountain Range from the Upper Gardens at sunset. The Upper Gardens have yielded hundreds of heads of garlic from last fall's planting! The garlic will be used in the kitchens this school year and will last until mid-winter. Chenoa Cameron-Lewis '17 tends to the carrot beds in the upper gardens. Chenoa is one of many students who are working on campus helping horticulture teacher Brad Miller maintain the greenhouse and gardens. Rising Senior Noa Sadeh's bike and pack outside Yellowstone National Park. As part of her Senior Capstone Project, Noa Sadeh '17 is undertaking a 3500+ mile cross-country bike trip from Eugene, Oregon back tome to Wilton, New Hampshire. Click here to visit Noa's Facebook Page 'Adventures on Wheels' to read about her journey and see photos from the road! Izzy BLASUCCI '16 and Noah WURTZ '16 peek out from "the duplex" (a faculty residence on campus). Before heading off to farm in Central America and study at Bard College (respectively) Izzy and Noah are working with the maintenance staff to prepare the campus for fall. Click here to meet the class of 2016 and see where they are going next! The Center for Anthroposophy (CFA) and has set up shop! Both this week and next Waldorf teachers from all over the nation are on-campus participating in the CFA/Antioch University Renewal Foundation Studies and High School Teacher Education courses, held annually at High Mowing School. School may be on break, but the gardens certainly are not! Horticulture teacher Brad Miller and his summer work crew (including Austin Davis '19 & Chenoa Cameron-Lewis '17) are hard at work harvesting thousands of sweet and ripe sugar snap peas.